Damen has supplied a DOP150 submersible dredge pump to Brazilian civil engineering contractor BELOV. It is now in operation, creating an access channel into the sea for a new power plant currently under construction. The access channel is for a critical pipeline for the plant’s cooling system and when completed it will extend 600 metres out into the sea. Over the course of the project the DOP150 is expected to remove around 30,000 cubic metres of material. The Damen DOP150 is being used to extract sand in the surf zone, varying in density from loose to medium fine. Working in such a dynamic marine environment presents challenges when it comes to delivering the flat, even surface required for the pipeline. Cables and other obstructions in the area also need to be worked around. The dredge pump is mounted on the boom of a 30-tonne excavator, itself mounted on tracks running along a pier. Concrete walls are being added to the access channel as the work proceeds to protect the piping. 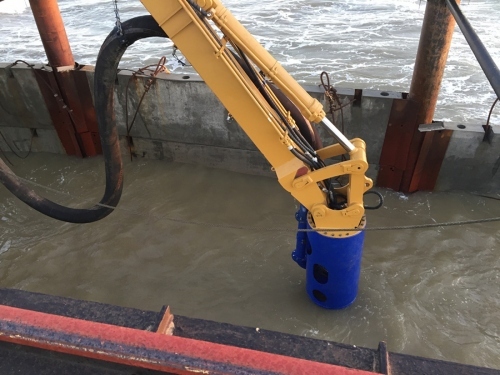 This particular model of Damen submersible dredge pump was selected due both to its ability to run off the excavator’s hydraulic power plant and the ease and speed with which the sand mining head can be exchanged for the cutter unit when the density of the material requires it to be broken up. An additional factor is its low assembly weight. The Porto de Sergipe I power plant is a 1,516 MW combined cycle, natural gas-fired design located in the state of Sergipe in the north-east of Brazil. A floating storage and regasification unit (FSRU) positioned 6.5 kilometres offshore will receive the LNG from tankers and supply gas to the plant via a submarine pipeline. Due to begin operations in January 2020, it will be the largest gas-fired power plant in the region. The DOP150 is the smallest in Damen’s range of submersible dredge pumps with an hourly capacity of 600 cubic metres of mixture. 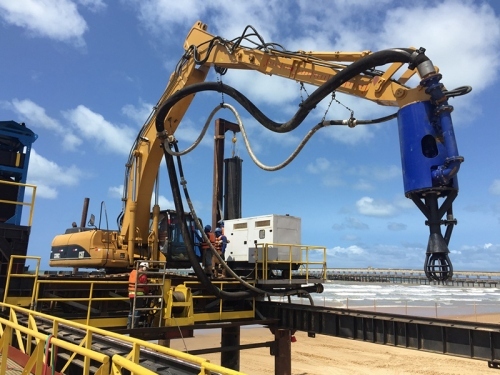 The DOP150 was delivered with both a jet water-assisted sand production head to be used in free-flowing sand, and a cutter unit to be used in compacted sand. The exchange between the heads can be done swiftly due to the practical identical mounting flange. The six-model range extends up to the DOP 450L, which can move 4,000 cubic metres an hour via a 450mm pipe. All are valued in the industry for their heavy-duty construction and high efficiency and can be found in operation all over the world.